Customer success determines retention rates in the membership economy*. If your member does nothing with what you sell her, she’s going to cancel your subscription. The old model of leaving it up to your customer to figure out how to get value from what you sell may have worked in the old one-and-done product sale world. Your membership and subscription growth is determined by how well you ensure customer success. It involves helping your members find a lifetime value in subscribing to your product or service. I refer to it as turning your subscribers into a vibrant tribe of followers. And, it starts with how you attract your them. With businesses that sell via individual transactions, customers are making their decision to buy from them based primarily on price. With subscription membership programs, you must be about more than a good price, or they won’t remain your members for long. You see businesses like Mac do this, when they promise a way to do everything simpler, opening a laptop and saving time by being a Mac user. Disney does this when they promise you a magical experience. Harley Davidson gives their customers the chance to transform into a rough, tough, cool-guy image just by putting on their leather. It’s about the subscriber believing in the transformation that your product/service is offering, and you need to know what that is and market it. This shift in marketing creates member loyalty, improves member value, and offers your members a community to belong to. When you have subscribers experiencing the transformation that you promised, you have begun the process of building a vibrant tribe. You’ll find that you don’t have to spend more on marketing or delivery. Each new member sticks around longer and they’re going to refer a friend. They will bring others in by sharing their stories. And, you can share their stories too. Feature your members’ transformations in your social media channels, emails or newsletters. Make them celebrities! When you give people this – when you focus on that power that your product delivers versus the product itself – it totally transforms your retention and how your business grows. Building a tribe of followers, a community of subscribers who find real value in your product, improves your member retention. This gives you the foundation for charging premium prices and offering upgrades to further develop their commitment. Altogether, this is the product of a focus on customer success. *The term “Membership Economy” was created by Robbie Kellman Baxter, author of The Membership Economy. 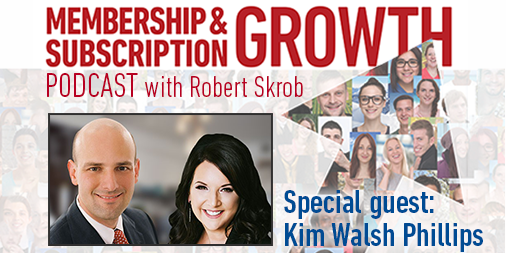 For more information on creating a vibrant tribe of followers, listen to the full interview on Membership and Subscription Growth. This interview was originally conducted by Kim Walsh Phillips for her podcast, Morning Coffee Marketer. Kim is an award-winning speaker, author, podcaster, and busy CEO leading three separate companies. She’s sold more online than anyone else, and has had a high volume of marketing clients. I absolutely recommend that you check out her book, an on-fire book, that’s called Game Changer. How to Get 10,000 New Real Fans in 72 Hours and Turn Them into Your Next Cash Paying Customers, Without a Marketing Budget.